Last year, I had the wonderful opportunity to edit Nancy Hendrickson’s Unofficial Guide to Ancestry.com. Before editing the book, I thought I knew Ancestry.com pretty well, especially since I often used it in my freelance work for Family Tree Magazine articles. But this book truly provides an in-depth look at the website and strategies for searching it. Here are a few of the favorite things I learned about Ancestry.com while editing the book. The Card Catalog is awesome. Sometimes it’s difficult to know exactly where to search or what databases are available for a certain location where your ancestors lived. The Card Catalog is a great tool to help you find databases relevant to your research. Nancy goes into detail about the filtering options you can choose to focus in on finding relevant databases. Posting a family tree is really helpful. I’m normally a pretty private person. In fact, writing a blog for the public to see is a little out of my comfort zone. So, the idea of posting my family tree online is a little scary to me, but after reading about all the ways having a family tree on Ancestry.com makes research easier, it’s made me want to post my tree online, just to get the record hints that are available by doing so. DNA for genealogy is super cool. After reading about AncestryDNA, how it works, and how it can connect you to relatives, I’m now very interested in trying this in my own research. 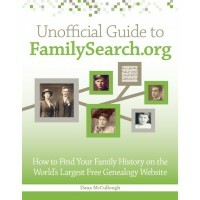 The Unofficial Guide to Ancestry.com went on sale last November, and is currently available through many book retailers including ShopFamilyTree.com and Amazon.com.